at the time of Tyrone Power's death. --- "If I should die tomorrow, I wouldn't be sorry because I have had a wonderful life." Mrs. Tyrone Power clutched her husband's hand and heard those words he told her before his death. They were spoken by his longtime friend, Cesar Romero, at Power's military funeral today. "He did have a wonderful life, and in that life, he brought much joy and happiness to many people." Romero eulogized before the Hollywood great who filled and lined the walls of the Chapel of Psalms in Hollywood Memorial Park Cemetery. Two thousand or more thronged outside. Throughout the half-hour ceremony, Mrs. Debbie Anne Power sat in a straight-back chair beside her husband's open casket. Her back was to the other mourners, but they could see her hold his hand fondly, her bent shoulders shaking with grief. She heard Romero read Thomas Wolfe's "The Promises of America," a hymn to the country Power had traveled far and wide, first as a young actor bearing his father's famous name and later as one of Hollywood's brightest stars. Power had planned to read the selection to American airmen at a base in Spain on Thanksgiving Day. She heard a Navy reserve chaplain, Presbyterian Pastor Thomas M. Gibson, read a favorite a Biblical passage of Power's, Song of Solomon 2:10-13. The actor was to have spoken the lines in "Solomon and Sheba," the film he was making in Spain when he died of a heart attack Saturday. An organ filled the chapel with songs reminiscent of Power's glittering career: "Always" from "Alexander's Ragtime Band" . . . "Mam'selle" the theme of "The Razor's Edge" . . . "Battle Hymn of the Republic" from "John Brown's Body" . . . Eddie Duchin's piano theme. 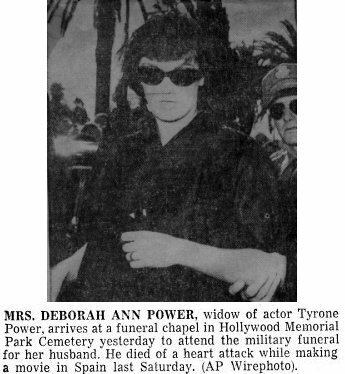 Mrs. Power, who will bear her husband's child in February, wanted none of the Hollywood aspects at the funeral. She reversed plans to seat the uninvited guests. The crowd --- some curious, some authentic co-workers of the dead star, the usual sprinkling of crackpots --- behaved well by standards of big Hollywood funerals. There was a burst of applause when Yul Brynner was sighted. But a glower from Brynner, who was growing a beard to replace Power as Solomon, quickly quieted that. A head-on encounter between the widow and Power's second wife, Linda Christian, was avoided. She had flown here from Paris and had her two children by Power brought up from Mexico City for the funeral. The widow wished otherwise, and Linda and her two young daughters attended mass eight blocks away at the Blessed Sacrament Catholic Church. Later Linda went to the cemetery with her daughters and placed a five-foot cross of carnations and gardenias on the grave. She knelt with a child at each side of her, said a brief prayer, whispered to each child and then left. About 100 persons were still in the cemetery. Hanging from the cross of flowers were three cards bearing separately the names of Linda and the daughters, Romina, 8, and Taryn, 6. The mourners also reflected the glory of Power's career . . . there was Henry King, who paused before the Philippines mahogany casket to say goodbye to the boy he directed to fame in "Lloyd's of London" and a dozen other films . . . Power's fellow stars of Hollywood's golden age: Henry Fonda, James Stewart, Gregory Peck . . . Billy Wilder, who directed his last Hollywood film, "Witness for the Prosecution . . . former co-star Loretta Young who came from a TV set in a Japanese costume . . . Danny Kaye, Clifton Webb, Brian Ahern, Herbert Marshall, Robert Wagner, Natalie Wood, etc. The flag draped casket was removed from the chapel by six of the actor's onetime buddies in the Marine Corps, one of them a Medal of Honor winner. In private ceremonies, the body was placed in a grave beside a small lake near the resting places of Rudolph Valentinio, Douglas Fairbanks, Norma Talmdge and other of Hollywood's biggest stars.